We manufacture and export Steam Generator. It is available with us at a reasonable price. 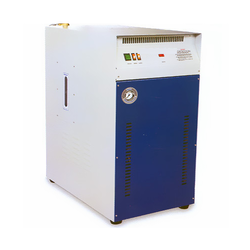 We are offering Commercial Steam Generator. We are offering Automatic Electric Steam Generator to our client and our product is made of good quality. Due to rich industry skill and experience, we have been accomplished to provide our valued customers the best quality range of Steam Shower Generator. Reservoir Capacity: 7ltr, 9ltr, 12 lit. Feature: Auto ON & OFF Control to save energy.